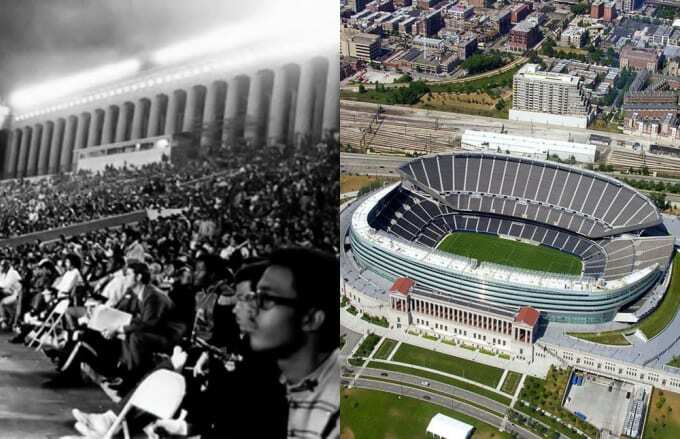 As part of the Chicago Freedom Movement, Dr. Martin Luther King, Jr. organized a huge rally at Soldier Field during the summer of 1966, and on July 10, a rumored 60,000 were in attendance to hear Dr. King speak. Also in attendance that day were gospel singer Mahalia Jackson and Stevie Wonder. After King tore into the Chicago Housing Authority for its atrocious conditions, denouncing the systematic racism of the housing selection process, he led protesters on a march through the streets of Chicago to place a list of demands at the office door of Mayor Richard Daly. Just as it was then, Soldier Field is the home of the Chicago Bears. Named for the fallen soldiers of past wars, the stadium closed in early 2002 for renovations. It re-opened in September of 2003, but was stripped of the National Historic Landmark title it received in 1984 due to the extent of the renovations. Soldier Field also holds the distinction of being the smallest NFL stadium, with a capacity of just 61,500.